"Does THE JOURNAL roast every show that comes to town?" inquired an advance man clad in plaid trousers and a waxed mustache. Well, not every one, but most of them this year. The facts and figures are that fourteen companies have received favorable notice and fifteen rather unfavorable. Even the most enthusiastic play-goers must confess that the theatrical attractions in Lincoln this year have been unusually flat, stale and unprofitable. Last season no one had any reason to complain. There were poor companies here, but there were also good ones. Seabrooke , Robert Mantell , Felix Morris , Frank Daniels , Clara Morris , Julia Marlowe , DeWolfe Hopper , Marie Tempest , W. H. Crane , "The Black Crook," Richard Mansfield and Alexander Salvini all played at the Lansing. Mr. Church deserves very great credit and considerable gratitude from the people of Lincoln for the class of amusements here last year. There is small profit and considerable risk in handling each attractions. But all of these, with the exception of Felix Morris, who was not sufficiently known here, drew crowded houses, and Mr. Church certainly did not lose money on them. With perhaps three exceptions every company that has played at the Lansing this fall has come straight from the Fifteenth Street theatre of Omaha, where they gave for 50 cents exactly the same performance that Lincoln pays a dollar to see. A critic who has any battered remnants of conscience left cannot avoid "roasting" such companies. It is impossible to pour glowing adjectives and to burn incense to Mr. Gustave Frohman's No. 13 company of boys and girls just out of a western dramatic school. No critic enjoys perpetually "roasting" performances. It grows desperately monotonous after a time. There is a limit to the harsh adjectives in the English language, and it becomes difficult as well as unpleasant, this "roasting" business. But any newspaper that bestows the same exorbitant praise upon a No. 13 Jane company that it humbly tenders Richard Mansfield puts itself in a very ridiculous position. There is only one standard of criticism, and that is justice; to pay respectful tribute to what is great, to gladly acknowledge what is good, no matter where it is found, to be gentle to what is mediocre, to be absolutely uncompromising toward what is bad. Charity, friendship, good nature, kindly feelings toward the house or toward the players have nothing to do with it. It is not a question of how great an actor's name is, of what some other critic has said, of what house plays him, of how hard the times are, but of what can this actor do. It is an unfortunate fact that inferior companies draw fairly well in Lincoln, and it is also an unfortunate fact that for a theatre there is more money in playing an inferior company to a fair house than a good company to a crowded one. The house, of course, gets a larger percentage in playing fifty-cent companies at a dollar than in playing standard companies at a dollar or even a dollar and a half. But the public gets tired of that sort of thing after a while and it will gradually lose confidence in a house in which it has always had the greatest confidence. Good companies have been near us this season, but they have "never touched us." 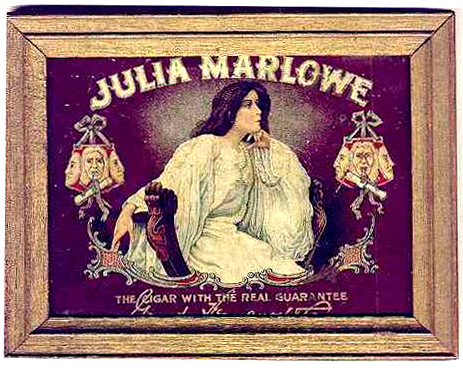 In Omaha Julia Marlowe played three nights, Charles Frohman's "Sowing the Wind" company three nights, Emily Bacher in "Our Flat" four nights, Rose Coglan two nights, Georgia Cavyan in "The Amazons" and the great Aladdin Jr. Extravaganza company. There are two sides to every story. If Mr. Church were here he would probably have another very good side to this one. Had he been here it is almost certain that he would have managed to coax some of the first class attractions down from Omaha, but it is not so easy to manage a theatre at several hundred miles distance. His representatives in Lincoln say that a number of good companies are booked for later in the season. Among them are: Ada Bothner in "A Bunch of Keys," Katie Emmett , the Tavery Opera company, the Seabrooke Opera company, "Old Kentucky," Sandow , "The Girl I Left Behind Me," Sol Smith Russel , "The Charity Ball," Herman , Ward and James , the Whitney Opera company, Paul Kauvar and Russel's comedians. One encouraging and rather remarkable feature about most professional people is the good natured way in which they generally take criticism. Of course every actor makes due efforts to impress a critic; he will try to convince you that he is second to none living, but if the truth is told him candidly and without malice he generally admits it, sometimes laughingly, sometime a little sadly. An old actor, whose bread and butter depends largely on his notices, will take quietly what an amateur, whose notice only affects his vanity, will bitterly resent. Sometimes an actor will even be grateful for an adverse criticism, though that, of course, is rather rare, for even when we acknowledge a defect, we all of us are resentful toward the person who tells us of it. If they have any complaint to make they make it in an honest, gentlemanly way. Comparing several letters from soubrettes and leading ladies who fancied they had been injured with some annonymous communications signed "A Club Woman," "One Club Woman," "A Friend of Clubs," etc, it is strange how much more courteious and womanly are the epistles of the actresses. They never resort to typewritten anonymous subterfuges, they write and spell in their own original and diverting way and sign their own names when they are fortunate to posses names—yet these people are not supposed to have very good traditions or much culture, and adverse criticism hurts not their egotism and boundless self conceit, but their income, touches the actual necessities of life. Artists, great and small, leaders and camp followers, have the credit of being the most conceited set of people who walk this unworthy planet. But that is a mistaken conception. The clossal egotism of the world is in Philistia, not Bohemia. The Bohemians make large pretentions, it's a part of their business. But they have great standards, that saves them. The most exalted leading lady after she talks about Duse twenty minutes is humble. In Philistia there are no standards and no gods. Each house has its own little new improved portable idol and could never be convinced that it was not just as good as any other idol. Here the great standards of art avail nothing, for these people patronize art. Every Philistine thinks he could be a greater actor, a greater painter, a greater poet than any Bohemian if he chose to soil his hands with art. It is no wonder that men like Mansfield and Salvini grow bitter and resentful toward this mighty Philistia which patronizes and criticises and ridicules art, but which is itself above criticism, beyond ridicule, sacred, exalted, holy, "like a city set upon a hill." "Is Mrs. Kendall a little tin anything on wheels? The reason I ask is because in speaking to a San Francisco interviewer about the chilling reception accorded to "The Second Mrs. Tanqueray" in that city, she is reported as saying: "They stoned Jesus because they did not understand Him and know He was Jesus." "The press," she also remarked, "is too much taken up with medical advertisements to have the time to devote to criticisms. Such newspapers and such news! "That the press should be shocked at anything—that is what is amusing," continued the irate lady. "First column, 'Sunday's Sermon;' second column, a medical advertisement, 'Lost Manhood,' whatever that may be; third column, 'Mrs. Tanqueray is Immoral;' fourth column, 'Husband Ran Away From His Wife—List of the Illegitimate Children; fifth column, 'A Full Account of the Prize Fight." "Mrs. Kendal evidently doesn't look skyward when she reads the newspapers—by the way, it seems to me it used to be her boast that she never looked into a newspaper, The blasphemy and the vulgarity of this San Francisco interview has not been matched recently. It places the matron of the British stage in quite a new light. Mrs. Kendal has made it plain enough that her trips to this country are made solely in the interests of the American dollar. When the dollar sticks in the public's pocket as in San Francisco, all her insular dislike of us and our institutions spills over. Mrs. Kendal is ungrateful. She has made money in this country after she ceased to prosper at home. She has been placed on a pinnacle of art higher than she ever dreamed of occupying in England and the unaccustomed height makes her dizzy. If Mrs. Kendal hopes to retain the patronage of American playgoers and maintain their delusion that she is a wonderful actress, it will be necessary for her to curb her unbridled tongue and comport herself with a degree of dignity appropriate to the position to which she has been so miraculously elevated." From the vindictive nature of Mrs. Kendal's remarks on medical advertisements it looks as though she has taken patent medicines, if so the state of her temper is not to be wondered at. Mrs. Kendal's present state of madness is largely dhe to the same American newspapers which she so bitterly reviles. The American press turned on a steady stream of maudlin praise when the Kendals honored this country by coming for its dollars. Newspapers were afraid to give her anything but xaggerated praise, because she was English and had a London reputation. They prostrated themselves in the dust before her and it is natural that she should trample on them. They have flattered this woman until she has become almost unbearable. The few newspapers that held themselves down to conscientious moderation are to be sincerely congratulated. The foolish and emotional awe of the American people for anything English is making Mrs. Kendal a very officious autocrat just as it made Lily Langtry a harlequin. The Lily, by the way, is here again and all loyal American hearts are beating with fond pride. The American public delights to make fools of foreign beauties by its servile worship, and this woman has more capacity, more inborn talent for being made a fool of than almost any other woman in the world. But however large a fool Lily may have been in affairs of the stage and affairs of the heart, she has always been perfectly sane on money matters. She has spent money prodigally but she always saw to it she had a steady income from some source. The Lily's friendship always came high and she has impoverished enough fellow idiots to make up for her extravagance. She has over $500,000 invested in this country now, besides her property in England. They say that the Lily is just as young and just as lovely as she was ten years ago. It's a peculiar trick that actresses have of keeping young. It cannot be due solely to their care of their persons, for the constant use of grease paints and cosmetics more than offsets any care of the complexion. The fact is they keep their youth because they keep their emotions. People always grow old inside before they do outside. When a woman sinks entirely into the conventional mould, when she begins to dissimulate before the world and to teach her daughters to dissimulate, then she grows old. Wrinkles are only scars of old fires that have burnt out and emotions that have been smothered. Actresses reach that period very late in life because they encourage feeling of every kind instead of checking it. They love and hate to distraction on the stage every night, and all the next day the warmth and color of it clings to their faces. Nobady is old who is capable of great emotions. The lines of the face only grow set and rigid after life has become so and the old well springs of emotion have been frozen by the chilling atmosphere of the everyday world. When the limits of a woman's world are her social duties, when she begins to be politic and discreet and advises her daughters not to read the books that used to be all in all to her, then her hair grows as gray as her life. An amusement incident happened in Omaha about three years ago when the great Bernhardt played there one night as she was hurrying back to Paris. After the play was over, and while La Tosca was divesting herself of the vision in light blue in which she had been indiscreet enough to jump into the Tiber, the enterprising little editor of the Omaha Bee presented himself at her dressing room door and offered to show the tragedienne through the Bee building. A peculiar little laugh and musical "entrez!" issued from the sacred interior, and Mr. Rosewater went serenely in. A little while afterward he reappeared with the willowy Bernhardt upon his arm, followed by her maid who carried a pile of cloaks and furs. With the greatest deference he seated her in his carriage and said to the driver in a loud voice. "To the Bee building!" He took her through it all, the editor's dens, composing rooms, mailing department, all of that beautiful building that is the "pride of two continents." A newspaper office is such a fitting place to take a beautiful woman anyway, a woman who has seen everything worth seeing on this planet. The dirty floors and dingy walls and the compositors in their shirt sleeves with their suspenders dangling down behind their stools must have been especially pleasing to the woman who drives through American cities in closed carriages because they hurt her aesthetic eye. It must have been hard on her gown too, but as Bernhardt was never known to pay a dressmaker's bill that was immaterial. After she had admired the great gothic masterpiece sufficiently, they drove back to the Paxton and concluded the festivities by an all night wine supper which permeated the upper corridors with loud laughter and the scent of Turkish tobacco and champagne. Yet this was the same Bernhardt who so scandalized Russia by her treatment of Count Zahetoff of the Guard of the Transfiguration some fifteen years ago. The count had completely lost his head, had actually made her a proposal of marriage. One night after the play he had a great fete for her in his palace. In the dead of winter, when the Neva was frozen over and the winds were sweeping down from Siberia and all Russia was under three feet of snow, he had a bower of roses built for her in the great hall of his palace, costing heaven knows how many thousands of roubles. He sent his own sledge for her, with its six black stallions, with silver sleigh bells, and its robes of sable and ermine. He gathered all his masculine friends and impatiently awaited the arrival of the sledge. It came, but it was empty. The actress sent him word by his own servants that she was reading a new novel of de Maupassant's and could not wait to finish it. The amiable count knocked his lacky down and went into the hall and tore down his palace of roses and trampled on them till he was tired and had made a nasty mess on his marble floor, and then he got very drunk and went to bed. This was the same woman who, when in defiance of respectable society and precedence she was invited to a court ball in Rome, sent her maid to represent her. Having insulted and outraged the greatest courts and dignitaries in the world, probably the very enormity of being asked in a western wilderness to accompany a wizen, little man of fifty through a printing shop rather fascinated her. She has a fondness for the bizarre and the only thing she really dreads or fears is ennui. Having made pets of boa constrictors and slept in coffins there was really no good reason why she should not go through the Bee building on the arm of Mr. Rosewater. One of the greatest improvements made in magazine literature this year has recently been made in the Dramatic Mirror. In type, illustrations, paper and general make up the Dramatic Mirror is now one of the neatest weekly magazines published in America. 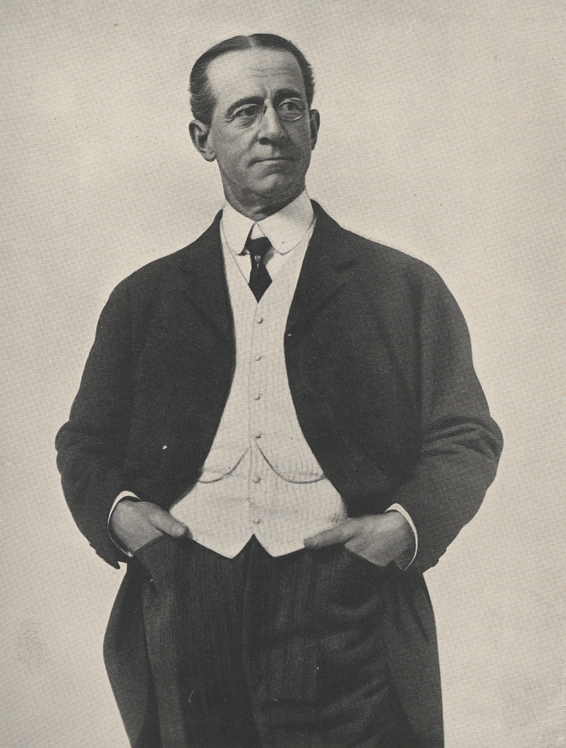 Mr. Harrison Gray Fiske has been the most successful and enterprising of any of the dramatic editors. There was a time when it was thought that a dramatic publication must necessarily be a rather scandalous sheet, containing chiefly news of the divorce courts. Mr. Fiske has conducted the Mirror along the most legitimate lines of journalism. He has made a magazine which gives the most importa t professional news, which treats the public fairly as well as the profession, and which is truly devoted to the interests of American plays and players. Through the columns of the Mirror, great actors who are at fault are plainly told so without regard to their "ad," and the weaker men who have been imposed upon are stoutly championed, Mr. Fiske has no taste for scandal, and in all cases he has absolutely refused to touch upon the private life of any member of the profession, and has kept the Mirror a cleaner paper than any daily newspaper in the country. The university library is one of the best places in town to find good nature and plenty of it. Not that there is nothing better than good nature, but good nature is a peculiarly rare article in this world, rarer even than culture. 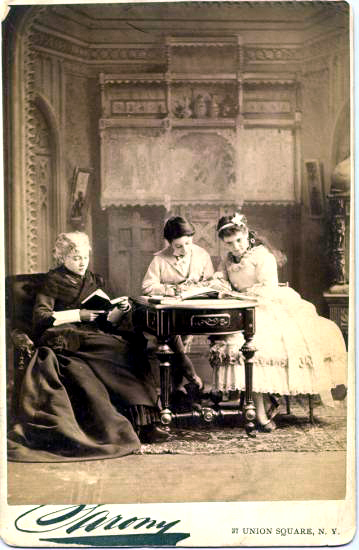 Miss Mary L. Jones and her assistants, Miss Mary E. Robbins and Miss Florence Smith , are conducting one of the best regulated university libraries to be found anywhere. In the first place, so far as books are concerned, the library is an unusually good one. It contains no old lumber and numbers about twenty thousand well selected volumes. Miss Jones and Miss Robbins both graduated from the Albany library school under the chancellorship of George William Curtis . They are both women of wide reading and of considerable faith in human nature. When Miss Jones went into the library it was but partially developed. Now all the books are catalogued according to the most complete system and any book or any subject can be found at a moment's notice. Without perfect system and the most scientific methods, it would be impossible to accommodate the large number of students who are now sent to the crowded library daily. It requires not only science, but unfailing patience. But even in this ungrateful world patience brings its reward. There is perhaps no professor in the institution who can be said to be absolutely popular and who does not have his one or two unruly students, but it would be safe to offer a gold medal for any student who has anything but the warmest regard for the librarian. Miss Jones has achieved the feat of being popular alike among the learned and the unlearned. The greatest drawback to the library of course is its abominably crowded condition. Ever nook and corner of the room is full, at one end there is even a little scaffold build to hold bound magazine literature, and up this Romeo's ladder the obliging librarians trip and do the balcony scene half a dozen times a day. 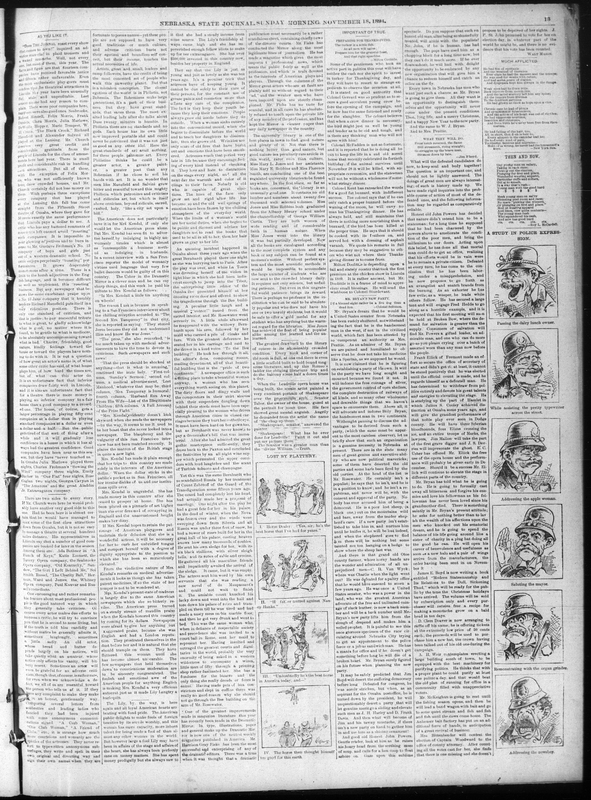 The Nebraska State Journal: The Nebraska State Journal was founded in 1867 by Charles H. Gere as the Nebraska Commonwealth, a solidly Republican newspaper. It became the leading paper in Lincoln for many years, finally merging with its rival, the Lincoln Star, in 1995. The managing editor for many years was Will Owen Jones; other employees whom Cather knew were Walt Mason, A. L. Bixby, and printer Flora Bullock, a classmate and the first bibliographer of Cather's journalism. Charles Gere's wife, Mariel Clapham Gere, and their daughters Mariel, Frances, and Ellen, were long-time friends of Cather. advance man: An advance man, or advance agent, traveled ahead of a theatrical troupe to make arrangements for its productions in the cities they visited: arranging for newspaper notices and other publicity, conferring with the theater manager, and arranging for accommodations for the members of the company. 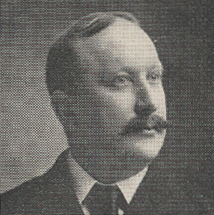 Frank Daniels: Frank Daniels (1856-1935) was born in Dayton, Ohio, but grew up in Boston, where he studied singing at the New England Conservatory of Music. One of his first important roles was in 1879 as the sheriff in The Chimes of Normandy. His first success was as a comedian. He toured for three years in the hit play, An Electric Doll, then had another success as Old Sport in Charles Hoyt's A Rag Baby. His biggest hit was as Packington Gilmedge in A. C. Gunter's Little Puck, which he played for seven years. He turned to comic operas such as The Wizard of the Nile, Ameer, and The Idol's Eye. William Winter called him "the comedian with the trick eyebrows" but says nothing about his voice, though Daniels recorded a Victor Herbert song, "My Angeline" in 1896. The narrator of Kenneth McGaffey's satiric novel, Sorrows of a Show Girl, said, "I was out with a kind friend the other evening whose general disposition is to try and make Frank Daniels look like a spendthrift" (chapter 1). 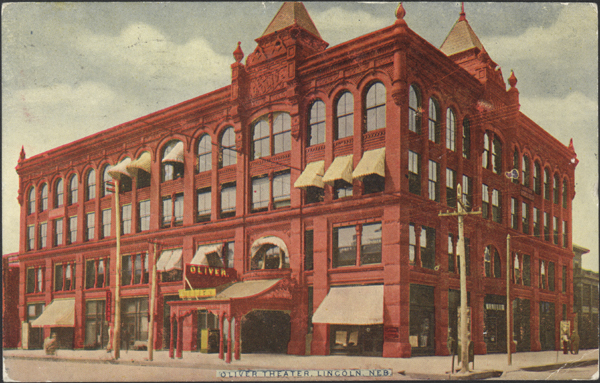 the new Boyd: In Omaha, the New Boyd Theatre, at the corner of 15th and Farnam, opened in September 1891, after a fire destroyed Boyd's Opera House (built 1881). Cather visited Omaha once in 1892 to see Sarah Bernhardt, probably at this theater. The theaters were named for their proprietor, the former mayor of Omaha and governor of Nebraska (1891-93), James E. Boyd. "never touched us": The source of this quotation has not been found. Emily Bacher: Neither the New York Times drama review index nor Odell's Annals of the New York Stage list an actress named Emily Backer or Backer. Our Flat: Our Flat (1889), an English farce-comedy by Mrs. Musgrave, was a success at the Strand theatre in London when Daniel Frohman bought the rights to it to fill a gap in his schedule caused by the illness of a leading actress. Our Flat, which opened in New York on 21 October 1889, concerns a young wife whose furniture is all removed because she can't make the final installment payment. "She extemporizes furniture by means of boxes, barrels, bathtubs, ironing boards and similar articles" (New York Times, 22 October 1889). When the secret is revealed at last, the hard-hearted father relents and the couple is restored to prosperity. 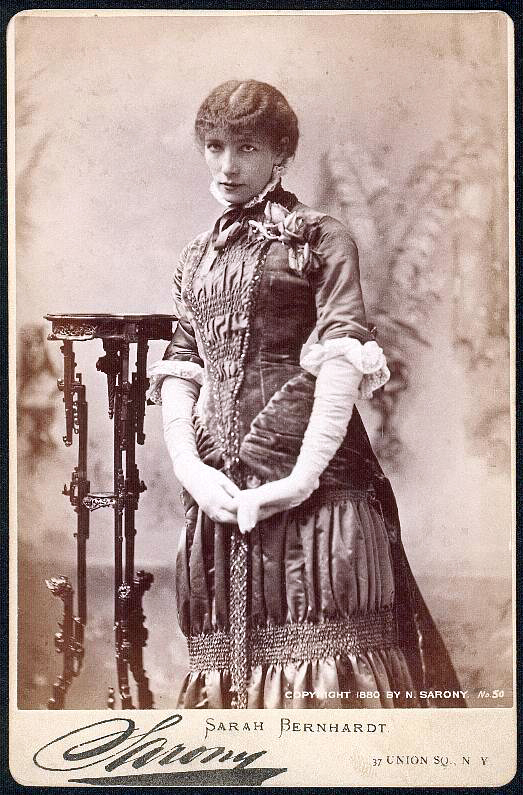 Louise Thorndyke-Boucicault played the young wife in the New York production. Aladdin Jr. Extravaganza company: The New York Times reviewer noted, when the spectacle of Aladdin, Jr. opened there in April 1895, that it had been playing in Chicago and had been long heralded. The review praised the beautiful costumes, scenic effects, and dancing, and predicted its success although the cast was not particularly strong and there were no particularly new ideas. 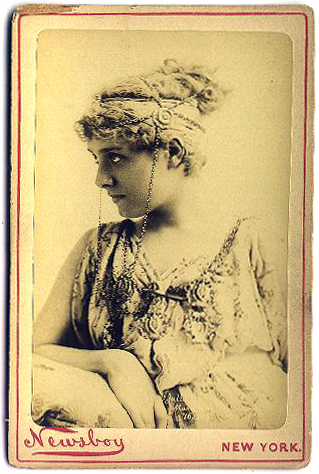 Anna Boyd played the part of Aladdin in the New York cast. If Mr. Church were here: The Lansing's manager, Edward Church, had formed a company to perform Faust and taken it on tour to Chicago and elsewhere. 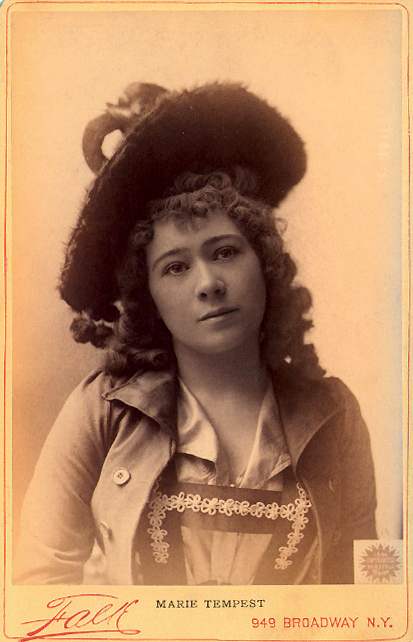 Katie Emmett: Actress Katie Emmett starred in a production of The Waifs of New York which ran for several years in the early 1890s in various minor theaters, according to Odell (XV). 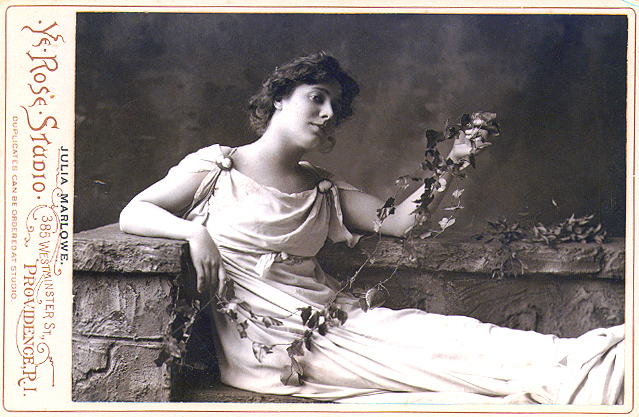 The New York Times records her appearance at a Broadway theater in Killarney (1892), and notes that she was "known 'on the road' in productions of that sort," that is, sentimental and/or Irish plays. 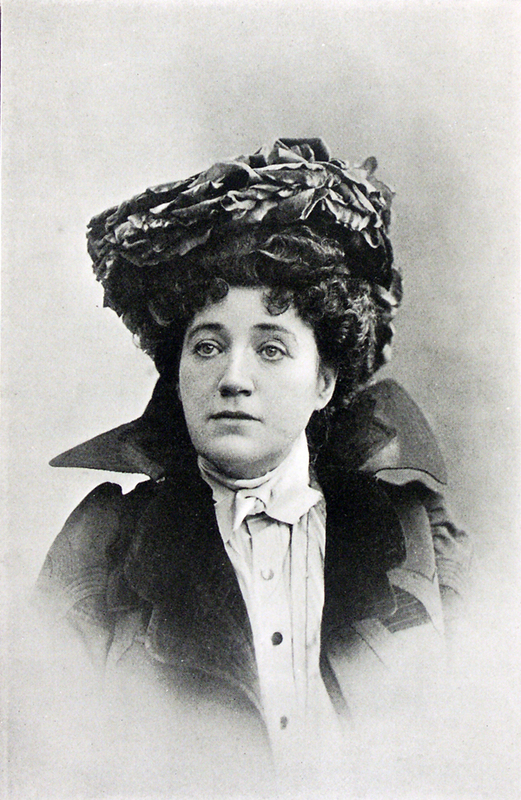 After 1892, according to Odell, she alternated performances of Waifs and Killarney. 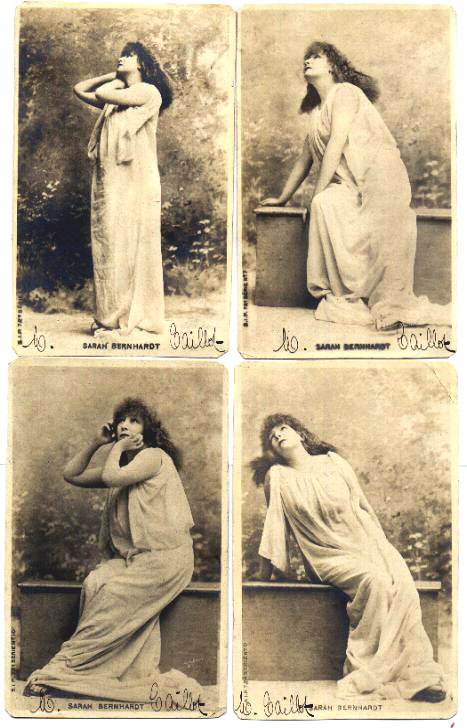 Marie Basta Tavary: German-born soprano Marie Basta Tavary was singing leading roles with the Minnie Hauk Grand Opera Company by 1891. 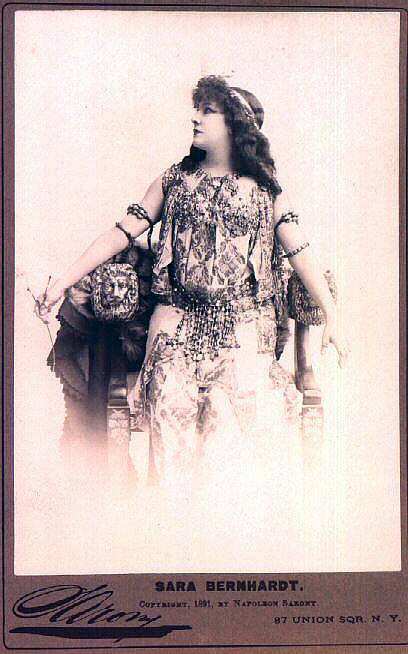 She made her debut at the Metropolitan Opera in New York as Donna Anna in Don Giovanni on March 4, 1893; she sang with Campanini, Eames, Scalchi, and others. She also sang with Gustav Hinrich's Opera Company in Philadelphia, from which she would draw many members of her own company in 1894. Her company toured the U.S. and parts of Canada for about three years. 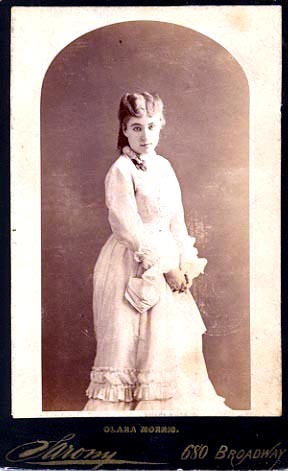 In October 1899 she appeared for a week at a vaudeville theater in Omaha. Tavary Opera company: The Marie Tavary Grand English Opera Company toured for several years beginning in 1894, managed by Charles H Pratt. 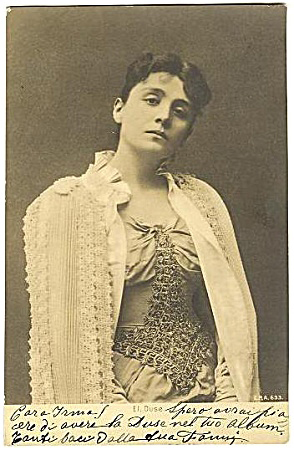 Marie Tavary was the leading soprano, with Thea Dorre, mezzo-soprano; Nina Bertini Humphreys, soprano; Helen von Doenhoff, contralto; Albert L. Guille, Payne Clarke, tenors; William Mertens, baritone; William Hamilton and William Schuster, bassos. All of these singers had been members of Gustav Hinrich's Opera company in Philadelphia. Other members included Emma Mariani, Dora Escott, Sofia Romani, and Karl Clause, William Warren, and J.C. Cheviot. 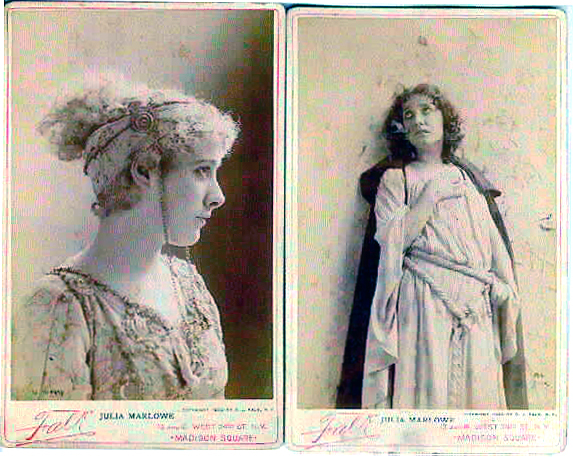 Their repetoire included Cavalleria Rusticana, Rigoletto, Il Trovatore, Martha, Carmen, Bohemian Girl, I Pagliacci. Emerico Morrealle was the conductor. The company visited Lincoln in December 1894 and April 1896. Eugen Sandow: Body-builder Eugen Sandow (1867-1925) was born in Prussia, and was impressed at a young age by Greek and Roman statues of gladiators and athletes, from whom he derived his ideal of the perfect body. He performed as a strongman in Europe and then in America, where he appeared at the 1893 Fair in Chicago. Under the management of Florenz Ziegfield, he added muscle display to his strongman feats (Edison filmed this in 1894), as well as posing as famous statues such as "The Dying Gaul." Sandow published five books on body-building and exercising for health; he also organized the first body-building contest in 1901, and developed and marketed exercise equipment. He is considered the father of modern body building. Mr. Russell: Sol Smith Russell (1848-1902), an actor, singer, and drummer, arrived in New York in 1871, where he joined Daly's Company. He became well known for his comedic performances and for his comedy, A Poor Relation, and he toured widely throughout the United States during his career of nearly 40 years. He became paralyzed in 1900 and died two years later. The Charity Ball: The Charity Ball (1889), a play by David Belasco and Henry DeMille, opened at Daniel Frohman's Lyceum Theatre November 19, 1889. The plot concerned a clergyman who believes himself in love with a young woman, only to find her weeping one night in his study with a confession that concerns his devil-may-care brother. In the end a marriage is arranged between the fallen couple, and the clergyman realizes his love for the saintly Ann, who has long loved him. 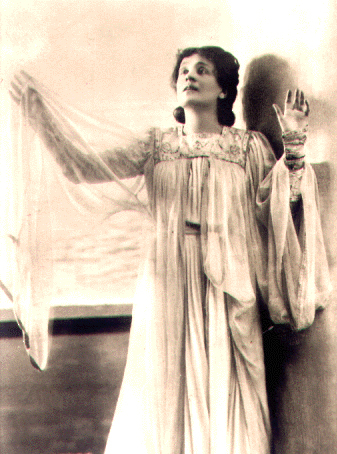 The original production starred Georgia Cayvan as Ann. The New York Times predicted a long run for the play with its beautiful effects and "easily appreciated pathos and humor" (24 November 1889). In one of the scenes, at a charity ball, a debutante auctions off the privilege of dancing with her, for the sake of the charity; the Times considered this an "extraordinary" incident. Whitney Opera company: The Whitney Opera company, headed by F. C. Whitney, toured extensively in the 1890s and early twentieth century. In 1893 Whitney joined forces with Col. Henry Mapleson and his wife, prima donna Laura Schirmer Mapleson, to produce De Koven's The Fencing Master. The rest of the cast at that point included Grace Golden, Thea Dorre, Marion Langdon, Georgie Dennan, Marie Belval, Hubert Wilkes, Gerald Jerome, Basil Tolson, Charles Bigelow, Fred Buckstone, George H. MacKenzie, and Max Eugene. 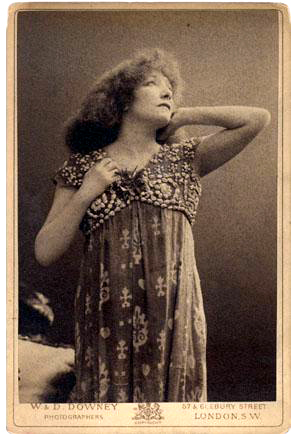 However, a program from c. 1894 shows that Marie Tempest was the company's leading lady, so there may have been other cast changes as well. 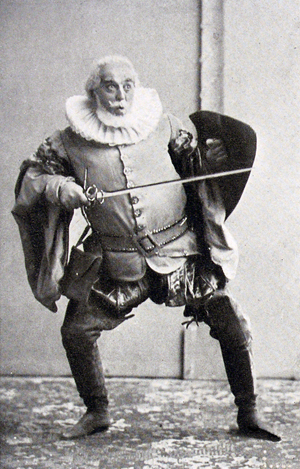 One of the Whitney's biggest hits was Smith and De Koven's Rob Roy (1894) which ran for at least 250 performances. Paul Kauvar: Steele Mackaye's play, Paul Kauvar; or, Anarchy (1887) is set during the French Revolution. Paul Kauvar, a high official in the Republic, repudiates the Reign of Terror and tries to save the woman he loves and her aristocratic father from both the mob and the government, putting himself in great danger as well. Russel's comedians: Possibly Sol Smith Russell's company. "A Club Woman"..."A Friend of Clubs": Cather wrote critically of women's clubs in several of her columns. Philistia: Philistia, the country of the Philistines, and thus metaphorically all those opposed to the true spirit of art. Bohemia: Metaphorically, Bohemia represents all artists and those opposed to the merely conventional ways of thinking and living. "like a city set upon a hill": In the Bible, Jesus says in Matthew 5:14, "Ye are the light of the world. A city that is set on an hill cannot be hid." Puritan leader John Winthrop said of the Plymouth colony in 1630: "we must consider that we shall be as a city upon a hill; the eyes of all people are upon us" as an example to the rest of the world. the Usher: The Usher was the pseudonym of a dramatic critic for the Dramatic Mirror. a little tin anything on wheels? : The title of Robert Grant's novel, A Little Tin God on Wheels (1879), became a popular expression for a self-important person. prostrated themselves in the dust before her: Originally a literal description of acts of abasement, prostrating oneself in the dust came to imply spiritual and emotional shame or, sometimes, humility. Lily Langtry: Lillie Langtry (1853-1929) was born Emilie Charlotte Le Breton on the Isle of Jersey, the daughter of a clergyman; she was nicknamed "Lillie" because of her fair complexion. In 1873 she married sportsman Edward Langtry, and the couple moved to London in 1876. A year or so later, she met the painter John Millais, who had lived in Jersey; he painted her in "The Jersey Lily" and she quickly became a famous beauty and a favorite in London society. She had affairs with royalty, including Edward, Prince of Wales, and his cousin Prince Louis of Battenberg, by whom she had a daughter. However, there was no money to support life in such circles; the Langtrys went bankrupt. Friends such as Oscar Wilde suggested she go on the stage; she worked hard at her acting, and was very successful: despite interests in racing horses and gambling (she was the first woman to break the bank at Monte Carlo), she invested her money wisely. 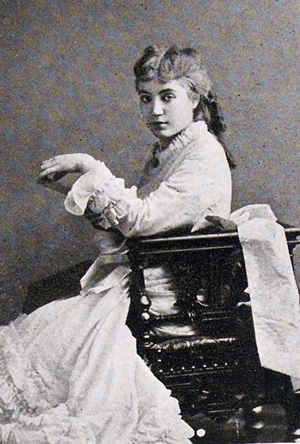 She was acclaimed in America on her first tour in 1882, and she returned often, becoming an American citizen, which enabled her to divorce Langtry in 1887. Returning to England to live, she married Hugo de Bathe in 1898, becoming Lady de Bathe in 1907. She separated from her husband and lived her last years in Monaco with her companion, Mathilda Peat. In Cather's The Song of the Lark (1915), Ray Kennedy removes a calendar that pairs Lily Langtry and Edward, Prince of Wales, by printing their pictures together before Thea and her mother can see it. The novel's British publisher, John Murray, asked that the passage be removed. The central character of one of Cather's last stories, "The Old Beauty," has many similarities to Langtry. harlequin: The Harlequin, a mischievous character in traditional Italian commedia dell' arte, one of the rivals for the love of Columbine. He traditionally wore a costume composed of alternating light and dark diamond-shaped pieces. Tiber River: The Tiber River, the third longest in Italy, flows through Rome. According to the legend, the twins Romulus and Remus were abandoned on the river to die, but the river god Tiberinus flooded the river, carrying them to the Palatine hill, where they were rescued by a she-wolf, who nurtured them. The boys were found and raised by a shepherd; they later founded the city of Rome at the site. Omaha Bee: The Omaha Bee was founded by Edward Rosewater in 1871. Politically progressive in many ways, its reporting was also aggressive and considered sensational by many opponents--an example of the school of yellow journalism. Bee building: Edward Rosewater built a new home for his newspaper, the Omaha Bee, in 1889 on the northwest corner of 17th and Farnam streets in downtown Omaha. The building was adjacent to the City Hall and across the street from the Douglas County court house. "entrez! ": French, "enter!" or "come in!" "pride of two continents": Presumably an advertising slogan used by Edward Rosewater, owner and editor of the Omaha Bee. the Paxton: The Paxton hotel in Omaha was built by the Kitchen Brothers in 1882 on the southwest corner of 14th and Farnam and named for cattleman William Paxton. It was considered the finest hotel in Omaha at the time, the place for distinguished visitors to stay. The 1882 building was demolished in 1928 and an Art Deco-style Paxton Hotel was erected on the site. scandalized Russia: Sarah Bernhardt included Russia in her European tour c. 1880-81, scoring one of her greatest triumphs in St. Petersburg, where she performed before Czar Alexander III, who bowed to her as she began to curtsy to him. Skinner's biography of Bernhardt recounts a story of this tour somewhat similar to the one Cather tells: a grand duke invited Sarah to supper; she told his emissary that she would be delighted to attend and would bring Jacques Damala (her lover and soon-to-be husband). The duke recollected a previous engagement and cancelled the invitation. Count Zahetoff: A Russian aristocrat of this name has not been identified. Guard of the Transfiguration: The Preobrozhensky Life Guard Regiment was founded by Peter the Great in the late seventeenth century, making it one of the oldest units in the imperial Russian army. It had its regimental holyday on the Russian Orthodox Day of the Transfiguration of the Saviour (August 19), but took its name from the village of Preobrazhenskoye near Moscow, a village also named for the Transfiguration. The regiment was disbanded in 1917.
the Neva: The Neva River in northwestern Russia flows from Lake Ladoga through St. Petersburg, built on its delta, to the Gulf of Finland. new novel of de Maupassant's: Guy de Maupassant's first novel, Une Vie (translated as A Woman's Life in English), was published in 1883. His first collection of short stories, La Maison Tellier, in 1881; it contained his first successful short story, "Boule de Suife," published in 1880.
the university library: The library of the University of Nebraska was housed in University Hall, first building on the campus. The rooms allotted to it were very inadequate to a growing university, so the state legislature appropriated funds to build a new library on the southwest corner of the campus. The shell was erected in 1893-94, but enough money to finish the building had to wait on the next session of the biennial legislature. The library was not moved into the new library building (now Architecture Hall and the oldest building remaining on the campus) until late in 1895, after Cather graduated. In O Pioneers!, Alexandra Bergson comes to Lincoln after her brother's death and lingers outside the library building, hoping to find a student who had known her brother in his student years. Miss Mary L. Jones: Mary Letitia Jones (1865-1946) was born in Wisconsin, the daughter of a Methodist minister. 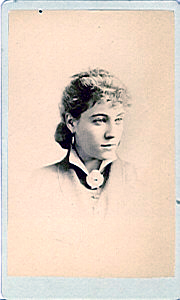 She graduated from the University of Nebraska in 1885, and from Melvil Dewey's library school in 1892, becoming the first professional librarian to be in charge of the University of Nebraska libraries (1891-1897), where she trained a number of students in cataloging and library science. She was a founder and first president of the Nebraska Library Association. A new chancellor, who preferred to have men in positions of authority, forced from her position at Nebraska in 1897. In 1900 she became director of the Los Angeles Public Library; she was dismissed in favor of a male, nonprofessional librarian there also. Thereafter she served as director of the University of California's summer library training school, as director of Bryn Mawr's libraries, and then returned to Los Angeles to work for the Los Angeles County Library system. Miss Mary E. Robbins: Librarian Mary Esther Robbins left the University of Nebraska and became director of the library science department of Simmons College, Boston, by 1905. She was active professionally in the American Library Association. Miss Florence Smith: Librarian Florence Smith graduated from the University of Nebraska in 1894; she had probably taken Mary Jones's cataloging class, for she was hired as assistant librarian, a post she held until Jones was forced out. She then served as librarian in Beatrice, Nebraska, before going to the Kansas City Libraries in the early twentieth century, where she was a reference librarian for many years. Albany library school: Librarian Melvil Dewey (1851-1931) was born in New York and graduated from Amherst College in 1874, whereupon he took charge of the Amherst library. He developed a system of classifying books with numbers to indicate the field of knowledge they belonged to, publishing his Dewey Decimal Classification and Relative Index in 1876. 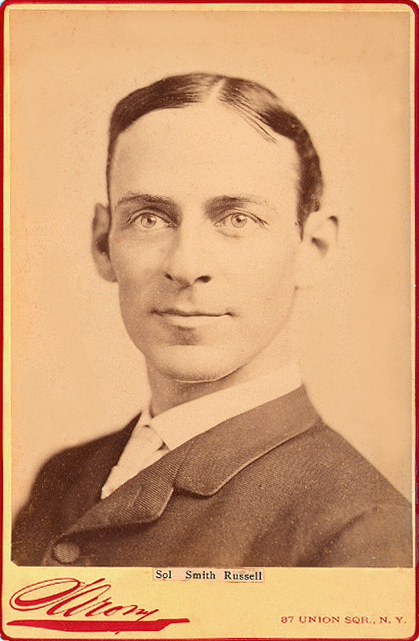 After heading the library and founding a library school at Columbia, he became librarian of the New York State Library in Albany, NY, in 1889, where he founded a library school which trained many of the first generations of professional librarians. 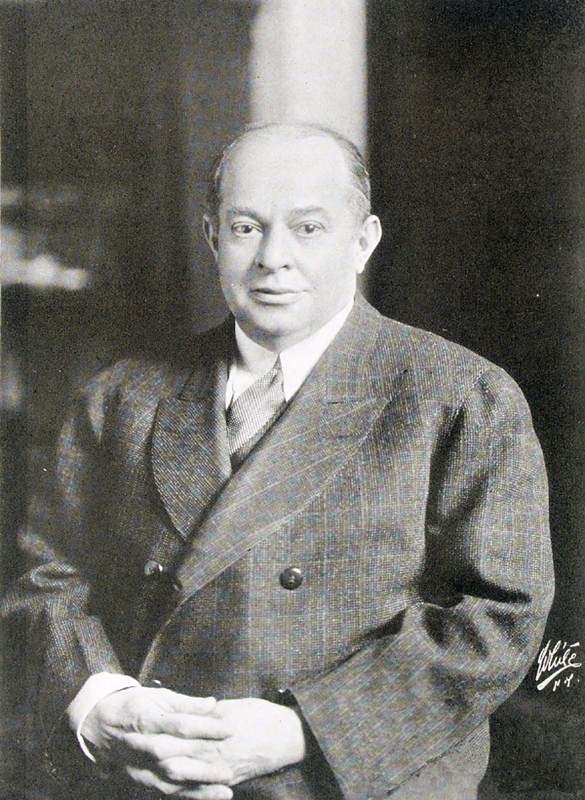 He founded the American Library Association and its publication, Library Journal. George William Curtis: American writer and editor George William Curtis (1824-1892) was born in Rhode Island. He boarded for a time with the Transcendentalists at Brook Farm, then spent some years abroad. He settled in New York, writing for Putnam's Magazine and Harper's Monthly. He became influential in the new Republican party in the 1850s and became a leading speaker and writer (as political editor of Harper's Weekly after 1863). He refused political appointments, and was chosen to chair the commission on civil service reform in 1871, becoming a leader in implementing reform. Towards the end of his life, Curtis was appointed chancellor of the New York State University, a position he held when he died. Romeo's ladder: In Act III, scene 2, the Nurse brings a rope ladder for Romeo to use to come to Juliet after their marriage. the balcony scene: In Act II, scene 2 of Shakespeare's Romeo and Juliet, perhaps the most famous scene in the play, Romeo slips into the Capulet's garden and overhears Juliet at the window. The two confess their love for each other and promise to marry. The scene is usually played with Juliet on a balcony to which Romeo climbs, but the play only says Juliet appears at a window.